I finally decided to give it a go at decorating a used can...and it was fun. :D I used an empty Milo can and just modge podged scrapbook paper on it and glued on some embellishments and voila! Easy peasy. This would make a super gift I think, and you can fill it up with tea bags, coffee, chocolates or whatever! Why buy an expensive container when you can recycle your own (& it'll probably end up being much prettier and more interesting than a bought one). Then I modge podged the scrapbook paper on, which I had to cut to size first. I used a bronze metallic marker to colour in the bottom rim of the tin that I couldn't cover with paper. Going Green Crafters & Artists . These little decorations were inspired by the ones I saw on Spoilt Rotten Beads. Finally, take a piece of silver string (I used about 20cm of string) and tie it around the loop ring so that you can hang it on your tree. Remember to send me a link of your ornaments if you decided to try 'em out too! Who Made What? Weekends! Party #15! ......this sheet music dresser by Lori over at The Alligator Box! Isn't it lovely? It was definitely one of my personal favourites as well. :) Some time ago I saw someone in blogland decoupage a candle with sheet music and I immediately loved it! 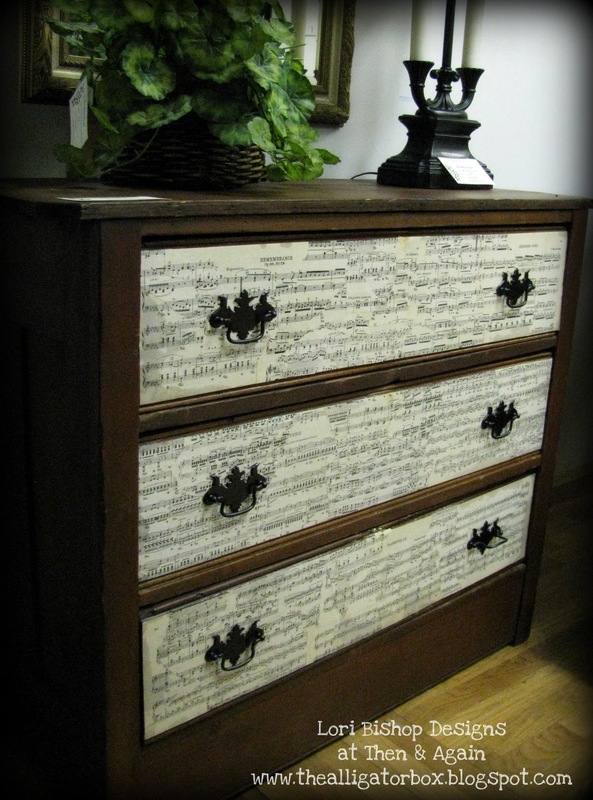 Seeing these drawers covered in sheet music has got me thinking what else might look pretty decorated with sheet music....I think I have an idea already.... :D This should be fun. Some of my baking supplies are in glass jars and some still in their original packaging, and they were all stuffed in my baking supply section of the pantry. So I decided to buy more glass jars (well, I still have to buy 'em) and put all my main baking supplies in them, and then make tags for them and move them to a kitchen shelf for display, where they can "brighten" up the kitchen a little, because the kitchen is too boring for my liking, hehe. So far I have jars for the ready-made (thanx to Nigella!) flapjack (pancake) mix, icing sugar & cocoa powder, so I still have to get jars for the castor sugar, white sugar, brown sugar & baking powder. I traced flowers with a stencil and cut them out by hand (some of us aren't yet lucky enough to have a fancy cutting maching, *sigh*). I cut out the first set out of brown cardboard so that they would be sturdy tags, and then another set out of green paper. Then I had to add the labels, so I stencilled a shape onto white card stock and glued it on. To decorate it a little more I added blings to the labels and a little ladybug (since my kitchen theme is ladybugs). I went for a garden-y theme for the tags. Overall I think it would have looked great to paste something directly on the jar instead of making little hangers like I did, but I thought this would be easier for when I have to wash the jars and I don't have to worry about the labels getting water damaged etc. I made this bracelet a summery garden theme with the use of glass leaves and butterfly charms. Now all I need is a battery for the watch. Making the World Cuter C.R.A.F.T. Who Made What? Weekends! Party #14! The fimo beads reminded me of a garden, so I went with a garden theme for this bracelet - some of the other charms I added were glass leaves and butterfly charms. Making the beaded bookmarks yesterday got me in the mood to make more beaded things, so I made myself a bracelet too! I used prettily painted wooden beads and rounded it off with 2 wooden black beads on either side. Left: a gold splashed bead rounded off with 2 black wooden beads. Centre: a gold painted wooden disk bead attached to a flower-like spacer. Right: a jasper stone bead rounded off with 2 wooden beads again. Left: gold painted wooden bead topped with a spacer and black wooden bead. Right: a pretty volcano bead rounded off with a spacer on each side. A fun little daisy chain bracelet. An ocean inspired seed bead bracelet. I used the cutest little mini sea shells on this one! A glass pearl & rose bracelet. Who Made What? Weekends! Party #13! Who Made What? Weekends! Party #12!